One of my first friends in Buundo village was Jajja Alice. When I first met her, I did not realize that she was related to such a large number of people who live here in Buundo. About a week ago she told me that she was planning to shift to live near her son, in Busoga. We live in the Buganda kingdom here in Uganda. If you head east, once you cross the Nile River, you enter the Busoga kingdom. Since it is a bit far and some family members also wanted to go, she asked if I might be able to help her move in our van. Our school year had not yet begun, so my schedule was more flexible. After talking with David and praying about it, I went and told her when I would be able available to take her. As we spoke in Luganda and then with some translation, I thought she told me that we would branch at the roundabout to Kumuli and the home was near there. That roundabout is only a few minutes beyond Jinja, so I thought the trip might take an hour or so each way. On the morning of "moving day" I arrived near her house and found many people there. Many of her relatives had come to see her off, and several others were planning to travel along with us. I didn't realize that much of the family would be going along, but I have a big van so we just loaded in, 1 trunk, several plastic bags full of clothes and personal items, 7 adults, 3 children, 2 ducks and a chicken. Before we left we took some time to pray for our travels and for the family to know God's love through Jesus. Some members of the family are believers, others are not. 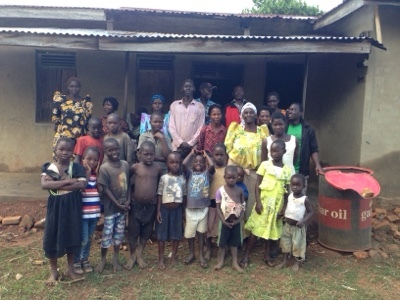 Then we took a photo of Jajja Alice with the family that lives on this side. As we passed Jinja and turned toward Kumuli at the roundabout, I thought we did not have much farther to go. Then I realized that I had misunderstood. The family actually lived beyond Kumuli (more than an hour's drive from Jinja). Then at the roundabout in Kumuli, we would turn and it would be a "little" beyond. In the end it was over 3 hours drive, although I'm sure the local taxis would be faster. The last stretch of the journey was on a road that seems to only be used regularly by bodas and bicycles. When we finally arrived, I found a nice compound where she would be living. 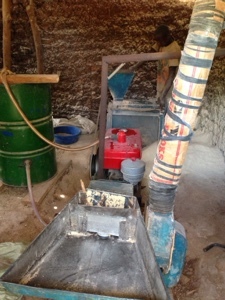 Alice's son owns a mill where many people in the village come to make flour from their maize. It was quite an operation. After showing us around, we went to sit in her son's house. While we were sitting I asked some questions about the family. I drew a version of a family tree and found that Alice has 38 grandchildren and 52 great-grandchildren so far. 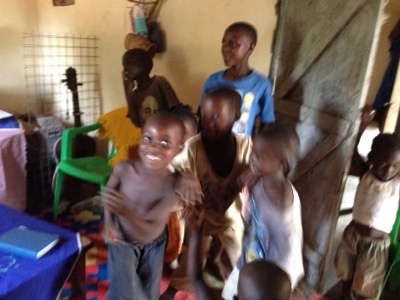 Some of those grandchildren and great-grandchildren are still young and were having a dance party, so I joined them. It was good for quite a few laughs. He has solar power to the house so they were able to play music. I thought it was probably time to head back, but they said that we cannot leave; they are preparing something for us. One of the teenage boys told me he had been preparing something for me as he was washing his hands. I knew that probably meant that they had killed some animal and were preparing to cook it. At that point I knew I would be there for several more hours and decided that I ought to call my husband so he knew not to expect me anytime soon. He graciously told me to enjoy the experience and he would hold down the fort at home. Since it would take awhile to clean and cook the dinner, I decided to walk around and see what others were doing. The daughter-in-law was out back cooking. 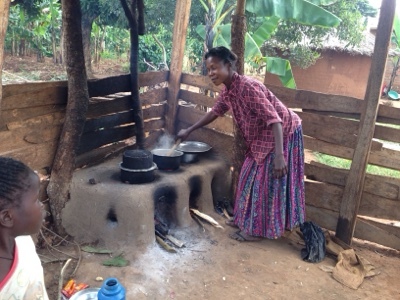 Most people cook over firewood or charcoal, but this family had built a more efficient type of stove to keep the heat in and to cook three things at once. The son was out chopping firewood. 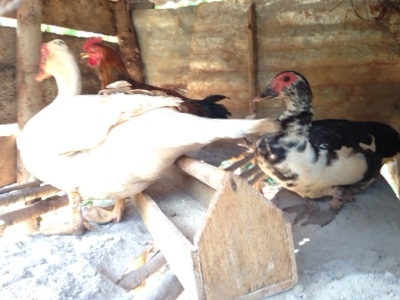 And I found the animals that we brought in their new home. So the dinner must be from some of the son's animals... It was good to talk with the family there. During the conversation they told me that they do not have a church nearby. I had brought a luganda Bible to read to the family while we were there. In that region they speak Lusoga, but the family also knows Luganda. The languages are similar since the tribes are both originally from the Bantu people group. Since Jajja Alice was asking me what to do, I gave her the Bible and asked her son if he would read it to her. (I don't know if she is able to read and her eyesight is not great.) I encouraged him to read it to the whole family. I told them that they could still pray and read God's Word together even though they did not have a church nearby. I suggested some passages for them to begin reading as a family. He seemed excited to have a Bible to read to his family. Sometimes I forget how blessed we are to have grown up with churches all around and Bibles in our homes. We often take those things for granted and fail to actually make use of them. 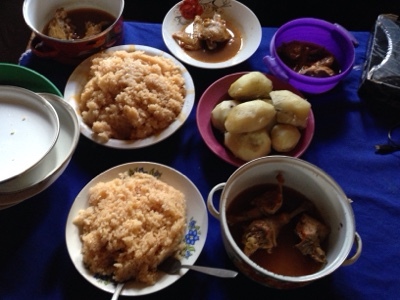 Before too long, the meal was prepared. It was quite the feast, chicken with some sauce, rice, sweet potatoes. They even brought me some silverware. 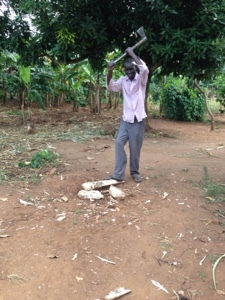 Here in Uganda meals are usually eaten with the hands. After the meal and washing up, we went over to the house where Alice will be staying. She wanted me to pray for her before we left. We gathered together inside the house and had a time of prayer. I took a family photo of them all in front of the house before loading up the van for the return trip. Our return trip was a bit eventful as we drove through a hail storm and several thunderstorms with heavy rain. I prayed a lot as I drove. 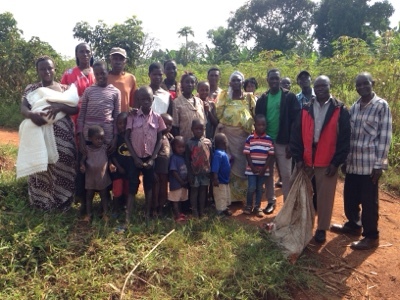 Around 6:30pm we reached Buundo village and dropped off the rest of the family. We praised God for bringing us back safely, and I went home to be with my family. My children came running out to the van; I was so thankful to be home! I praise God for the opportunities that my day in Busoga provided. Many times I have an idea of what the day might hold, but it is good to remember that God may have other plans for us.